Are you looking for the best responsive HTML5 medical template? Yes! You are in the right place. In this post, I will describe the best and top rated HTML5 medical template for your website. Important to realize, it will be hospital management template who is providing health and medical services. Any individual doctor or owner of a clinic or hospital can use it for their digital presence accurately. All templates are well-optimized and have been built with clean code. 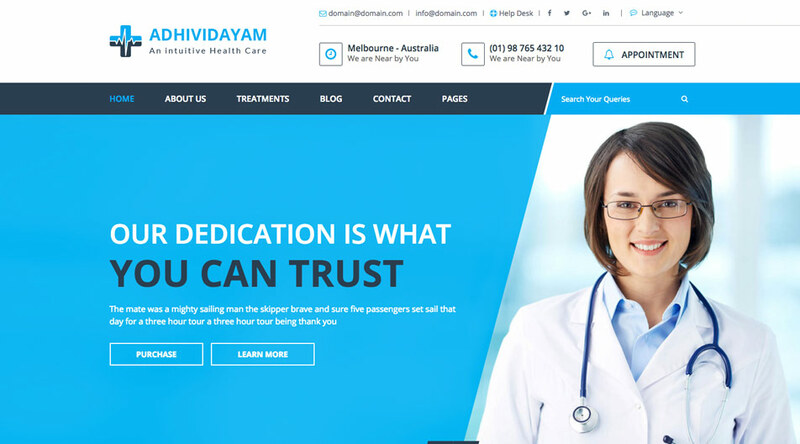 If you want to build an attractive and user-friendly medical and health website today, you can check this best responsive template. Must be remembered, a professional website with good UI environment can make the brand more attractive. Let’s take a look of the best responsive HTML5 medical template in details. 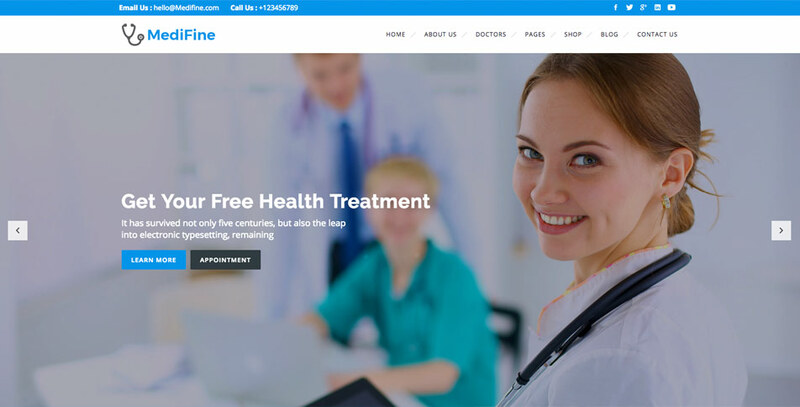 If you don’t know which templates can help you most for medical and health website, you should take a look at this top rated templates. With great design and unique UI, it can surely help you to make a stunning health and medical website. Do you want a permanent solution for your website’s template? Let’s see the top new collection in 2017. Have you ever looked this template for health website? If you see the overall design and UI, you will love it most. 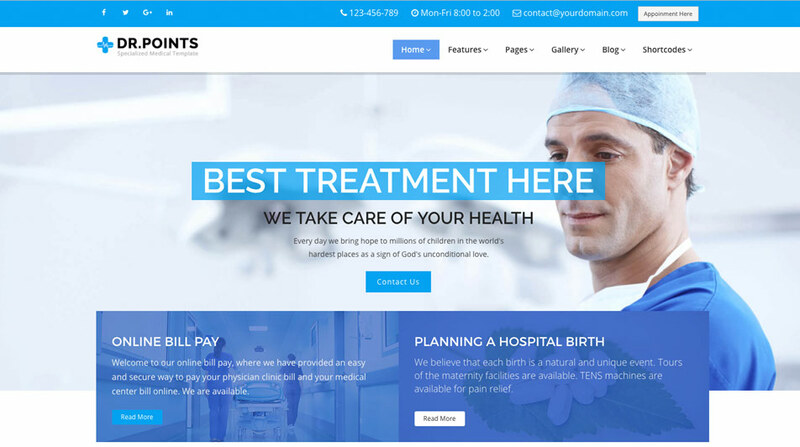 Trendy Theme publishes it in April and from then users consider it as the best responsive HTML5 medical template. With amazing UI and UX, use of animation, a stunning slider with a call to actions, full functional appointment page and emergency support page has made the template more unique and multifunctional. Health Nor has been built with HTML5, CSS3, and Bootstrap. The use of animation and supportive medical user interface has made this templates more unique. The full template has developed by considering medical and health services. Surprisingly, it has added 45+ attractive and unique pre-made pages which can fulfill your all types of need by editing the text and image only. Separately, it has included impressive doctor page. Here, you can highlight your experienced doctor with all types of qualification. You will get staff page also and you are able to highlight the staffs very amazingly. On the other hand, you can show your legal certificates and other’s company documents and certification from the legal pages. If I tell in one word, you have no need to check anywhere for medical and health templates, as you will get all the functions and needed in Health Nor. In my opinion a template with all the latest features and technology. It can be defined all in one template for health and medical services. Health is an another responsive HTML5 medical templates. You can use it for any types of medical and health services including hospital, clinic or medical related practices. It has used 3 different home pages to give your website an amazing view. Health template has been built with HTML5 and CSS3. Not to mention, it has used Google font, Bootstrap Grid system with responsive design. You will be able to add all the contact information on the header with social media icon. You can show testimonial of previous services and you will be able to maintain blog pages to provide essential update and tips from your websites. By the same token, you can show your useful information and link in the footer area. 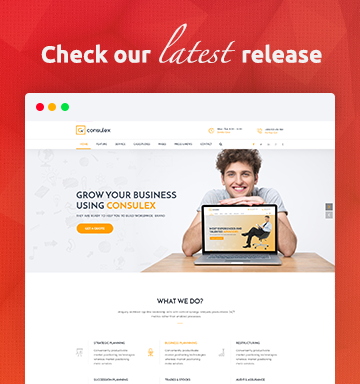 MediFine is a multipurpose responsive health and medical template. It has included 5 home pages style with a unique look. The template will be suitable for any types of hospital, clinic or health services. If you run personal health services, you can also use it for a professional website. On the other hand, it has added documentation folder to install setup and customize the template very easily without any specific tech knowledge. From the navigation panel, you will be able to go any important pages. The slider is very amazing with the important call to actions. You will be able to show your experienced team, contact details, photo gallery and department from the home page. 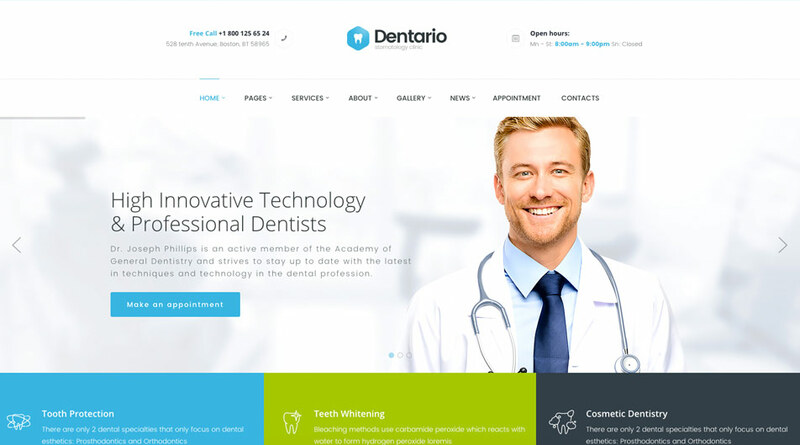 Dentario is an ideal responsive HTML5 medical template for dental clinics. You can also use this for any other health or medical services including hospitals, research centers, or pharmacies. It provides extensive documentation which will help you to install and setup the website quickly. The template is responsive and cross-browser support. It is very lightweight and optimized for search engine. In the Dentario template, you will be able to show contact information and brand logo. On the other hand, it has used a big slider in the starting of the web page and you will be able to show some actual image with services details. You will be able to provide contact information with Google Map direction. 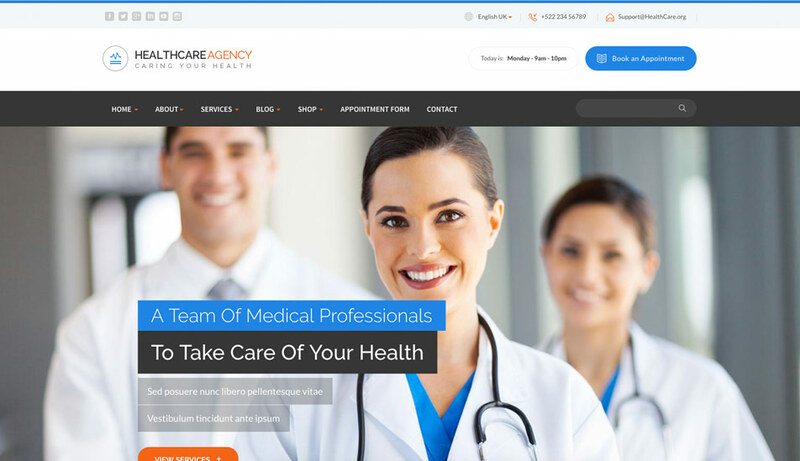 Health Care Agency is a multi purpose HTML5 medical template. It has been built by considering all the aspects of health and medical sections. It has included 2 home pages and about us pages. On the other hand, it has added 3 unique service pages, doctor page, and blog page. Notably, you will also get shop pages for selling anything online from your medical dispensary. It has been built with HTML5, CSS3, and Bootstrap. The theme is responsive and multi-functional. You will be able to highlight doctors or services by this template. You will get blogging area to keep updated your visitors with different services, offer or tips. 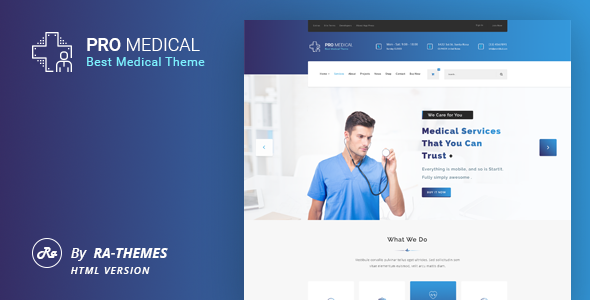 ProMedical is a premium HTML5 medical template and it is very suitable for medical, health, and hospitals. It has included some must need pages including appointment form, gallery, and testimonial. The template is lightweight with unique home pages and custom pages. In the ProMedical template, it has added the signup information and company information. From the navigation menu, you will be able to access all the websites very quickly. On the other hand, it has used an amazing slider, you will be able to show some promotional images with text. You will also find blogging, contact information. 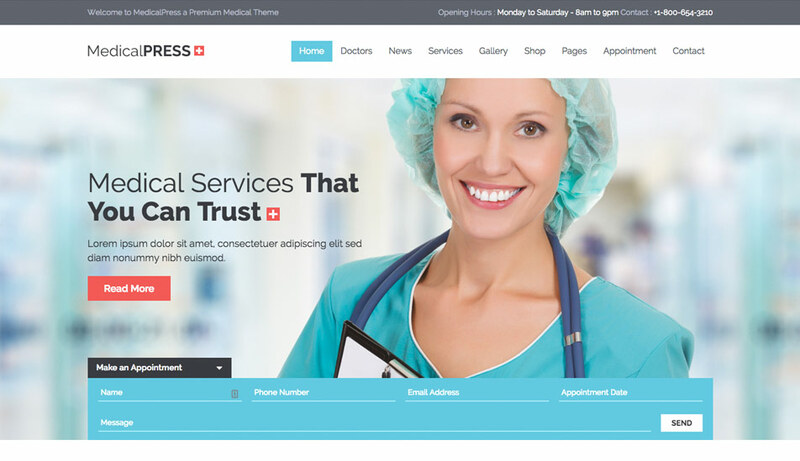 MedicalPress is a popular health and medical HTML template and it’s responsive and multifunctional. The template is search engine friendly with a good combination of H1..H6 tag. You can use it for any types of health or medical services including hospital, clinic or dentists. 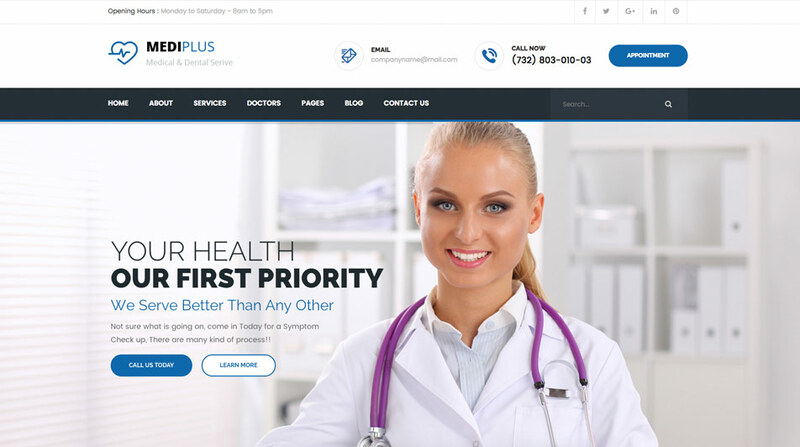 MedicalPress HTML5 medical template is ready for all types of medical pages including appointment, services or company profile. It has also included doctor page, testimonial area, and contact form integration. The use of animation is very attractive and the easy integration of appointment in the slider area is so amazing. 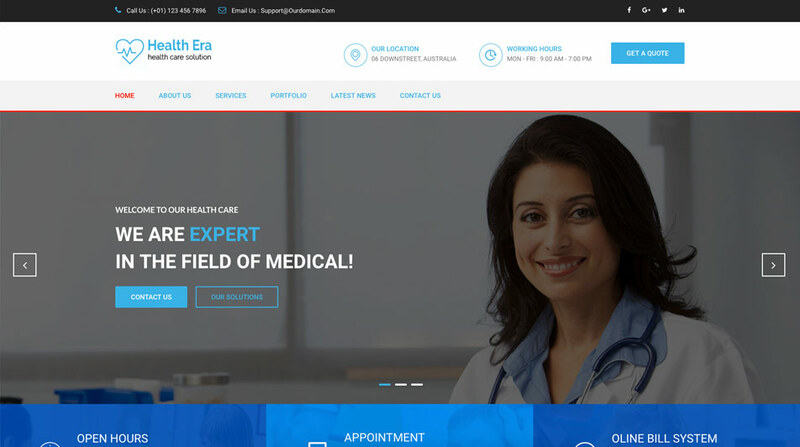 Health Era is a health and medical HTML template and very suitable for hospitals, doctors, and clinics. It has developed with HTML5, CSS3, and Bootstrap. It’s a responsive template with full functional for any browser. In health Era template, you will find short contact information including phone number, email address, and services time. You will find three different home pages and appointment area on the side of the sidebar. On the other hand, you will be able to highlight the different important section from the home pages. You will be able to customize all the section very easily. It has used a big footer area, you will be able to add the important link and small intro on the company and social link and recent post. When patients come to you, it’s very much responsible providing necessary information within the short time and Medi Plus can help you to complete the task. The template is very simple and clean coded HTML5 medical template and you can use it for any types of health or medical services. In the template Medi Plus, you will find all the necessary contact details in the header section and important pages have been added in the navigation section. On the other hand, appointment, billing, and services time have been added in the header area. Surely, you will get other important areas like services, portfolio, blog, team, testimonial and large footer in the template. If your main objective is creating a professional website for hospital management, then DrPoints can help you. It will support all the browser and it has been published with good documentation. In the template DrPoints, it has brought with tons of pre-made pages. You will get the single page and multiple page layout in one place. On the other hand, it has made 6 unique home pages. With mega menu and the professional color combination has made the template more gorgeous. The template is responsive and you can use it for any types of browser and devices perfectly. If I give a conclusion, all the template are unique in design and very perfect for health and medical services. If you see the first to last, I can recommend you Health Nor for their great UI which is very perfect for hospital management. On the other hand, it has used all the latest technology and it will provide you a lightweight and functional web page. 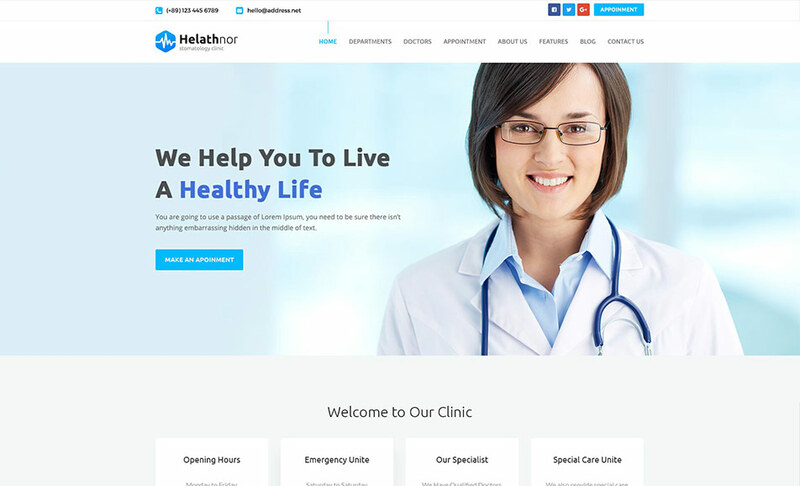 I have made the list to inform you about more functional medical temple, so now it’s your turn to choose a stunning HTML5 template for medical and health services. Never forget to inform us, which one is able to fulfill your need. If you get this article helpful, share it on your favorite social media and any types of need make a response from the comment section. Thanks in advance.